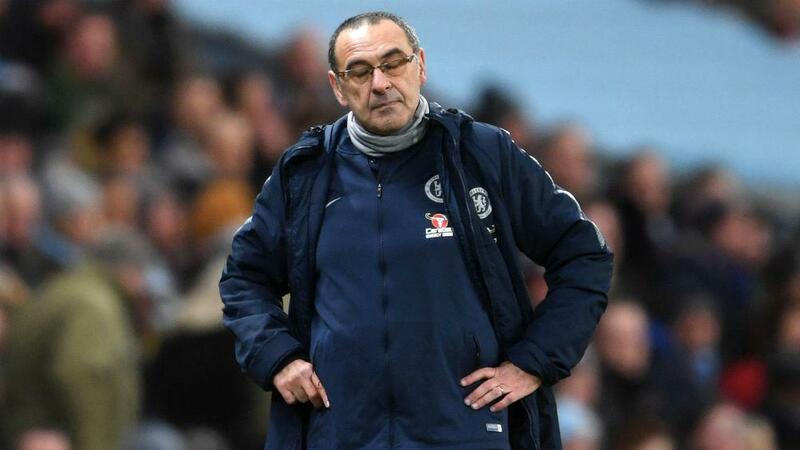 Chelsea coach Maurizio Sarri is yet to hear from club owner Roman Abramovich despite the Italian saying he would be "happy" to talk to him in the wake of the 6-0 humiliation at the hands of Manchester City. Sarri's men were blown away on Sunday as Sergio Aguero's record-equalling 11th Premier League hat-trick inspired City's emphatic win at the Etihad Stadium. That battering came on the heels of a 4-0 thumping at mid-table Bournemouth in Chelsea's previous Premier League away game. Speaking on Italian TV after the game, Sarri said he would like to speak to Abramovich because "I never hear from him", adding that he did not know what to expect with respect to his future at the club. Chelsea's Russian owner is yet to pick up the phone, however, with Sarri preparing his side to bounce back away to Malmo in the Europa League on Thursday. "Not in this week," Sarri told reporters when asked if he had spoken to Abramovich yet. "It depends on the president. It's not never, just not very often [I speak to him], [but] not never. "The interview was in Italian, I am better than you at this [speaking Italian]. I will speak to him, not this week. "I would like to speak to someone of the club, not necessarily the owner. I speak to Marina [Granovskaia, club director] and for me that is enough." Sarri accepted this week has been difficult in the wake of the City loss, though he is adamant motivation was not their problem at the Etihad. "Not too easy of course," he said. "After a match like in Manchester this is normal. It is not easy to play tomorrow [Thursday] after losing 6-0. "We want to play well and win. It will not be really very easy. They are compact and solid and have a good defensive phase. We want to win. "The last match wasn't a problem of motivation. In the first four or five minutes we started well. We were not able to react. "We need to solve the problems. I think sometimes, like the match against Tottenham in Premier League, we had not the right approach. This match was different. "We had good training, we had the right motivation. We conceded and then weren't able to do anything."